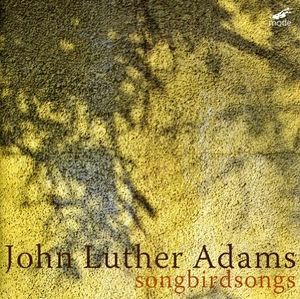 Songbirdsongs is among John Luther Adams’ seminal works. This is the first time the cycle appears on CD. Although music has been written involving the sounds of birds for centuries, no composer has ever approached the concept in this way. Based on Adams’ observations and studies of actual bird songs, he scored them for various ensembles of piccolos, ocarinas, flutes and percussion. Rather than having a fixed score, each piece consists of a collection of unordered phrases for each instrument. To create a performance, the musicians interpret their parts according to the instructions found in the score’s notes, maps, and parts — instructions that are carefully derived from each bird’s singing behavior. Adams not only represents birdsongs accurately but also allows performers to piece them together with the unique patterns and spontaneity of the birds interacting with one another in nature. Each movement of songbirdsongs features specific birds collected together by their region and shared habitat. The result is a work of natural beauty, vivid colors and atmosphere. Liner notes with musical illustrations by David Shimoni and John Luther Adams.